"Red Mitchell sat with Les [Koenig] through the whole thing [Ornette's audition for Contemporary]. The group played a few charts of Ornette's, and the next thing we knew we had an album date." Largely self-taught, Ornette Coleman began on alto saxophone at fourteen and played tenor with rhythm-and-blues groups in Texas before leaving for Los Angeles with Pee Wee Crayton's band. After gigging around he went back to Ft. Worth, then returned to Los Angeles in 1954. There he supported himself as an elevator operator and studied harmony and theory textbooks. He evolved a theory he subsequently called "harmolodics" in which his improvised melodies were not based on conventional chord progressions. His solo style sometimes sounded like a country blues singer with elements of a southwestern hoedown and essences of Charlie Parker. More than any other musician, Coleman influenced others, including Sonny Rollins and John Coltrane, to play in a free style. In the summer of 1959 Coleman and his sidekick, trumpeter Don Cherry, attended the School of Jazz at Lenox, Massachusettes, and recorded for Atlantic before making their debut in a quartet at the Five Spot Cafe in New York that fall. Among the subsequent albums for Atlantic was Free Jazz, thirty-seven minutes of spontaneous improvisation by a double quartet. In the mid-sixties he formed a trio with bassist David Izenzon and drummer Charles Moffett, touring Europe and recording in Scandinavia. In 1972 Coleman added saxophonist Dewey Redman to his quartet and combined it with a symphony orchestra to play his extended work "Skies of America" at the Newport Jazz Festival in New York. 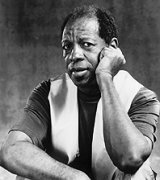 In the eighties Coleman's groups began using two guitars and electric bass, and his music more and more reflected his early rhythm-and-blues experience. A selected discography of Ornette Coleman albums. Tomorrow Is The Question, 1959, Contemporary. The Shape Of Jazz To Come, 1959, Atlantic. At The "Golden Circle" In Stockholm, 1965, Blue Note.